collectSPACE - news - "X-15 astronaut Pete Knight dead at 74"
May 8, 2004 -- California state Senator William J. 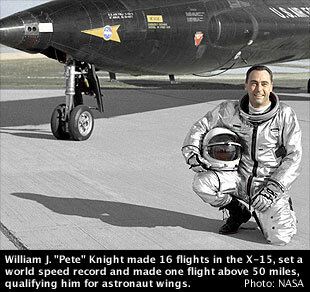 "Pete" Knight, a former test pilot who earned his U.S. Air Force astronaut wings flying the X-15 rocket plane, died Friday evening, May 7, of leukemia at age 74. Knight was one of six test pilots selected by the USAF in 1960 to fly the X-20 Dyna-Soar which was slated to become the first winged orbital space vehicle capable of lifting reentries and conventional landings. After the X-20 program was canceled in 1963, he completed astronaut training at the USAF Aerospace Research Pilot School at Edwards Air Force Base, Calif., in 1964 and was selected to fly the X-15. Knight set a world speed record by piloting the X-15 to Mach 6.7 - 4520 miles per hour - on October 3, 1967. Two weeks later, on October 17, he climbed to an altitude of 280,500 feet, over 53 miles above the Earth, earning his astronaut wings from the Air Force. On an earlier flight in June 1967, while climbing through 107,000 feet at Mach 4.17, he suffered a total electrical failure and all on-board systems shut down. After arching over at 173,000 feet, he calmly set up a visual approach and, resorting to old-fashioned "seat-of-the-pants" flying, he glided down to a safe emergency landing at Mud Lake, Nevada. For his display of airmanship that day, he earned a Distinguished Flying Cross. In all, Knight made 16 of the 199 X-15 flights. After nearly ten years of test flying at Edwards, he went to Vietnam in 1969 where he completed a total of 253 combat sorties in the F-100. Following his tour, he served as test director for the F-15 System Program Office at Wright-Patterson Air Force Base, in Ohio. Knight became the tenth pilot to fly the F-15 Eagle and completed some of the initial evaluations of the fighter. Knight later returned to Edwards as vice commander of the Air Force Flight Test Center in 1979. During this, his final active duty assignment, he remained an active test pilot in the F-16 Combined Test Force. After 32 years of service and more than 6000 hours in more than 100 different aircraft, he retired from the Air Force in 1982 with the rank of Colonel. In 1984, he was elected to the city council of Palmdale, California, and, four years later became the city's first elected mayor. In 1992, he was elected to serve in the California State Assembly representing the 36th District and, since 1996, served as a state senator representing California's 17th Senate District. Among his many honors, Knight was inducted into the National Aviation Hall of Fame (1988), the Aerospace Walk of Honor (1990), and the International Space Hall of Fame (1998). Knight died of an acute form of leukemia at City of Hope National Medical Center in California his communications director David Orosco told the Associated Press. Knight is survived by his wife Gail, sons William, David and Stephen, four stepsons and 15 grandchildren.